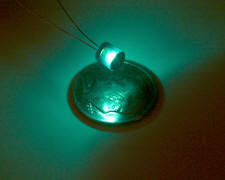 Incandescent subminiature lamps typically used in integrally illuminated instruments and panels have a broad emission throughout the visible spectrum. However, the majority of the radiated energy lies in the infrared region. Filament temperatures vary over a very broad wavelength range extending from 400 nm in the visible (blue) region to 10,000 nm in the far infrared. Typical color temperatures for low wattage subminiature lamps range from 1850°K – 2275°K. 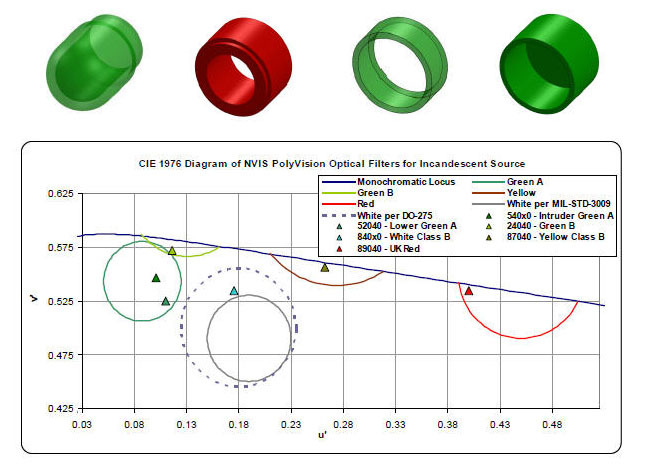 Lumitron offers a complete product line of NVG compatible and fully compliant NVIS Glass (NG), PolyVision (PV) optical filters, and lamp assemblies designed specifically for filtering incandescent light sources for NVIS compliance. 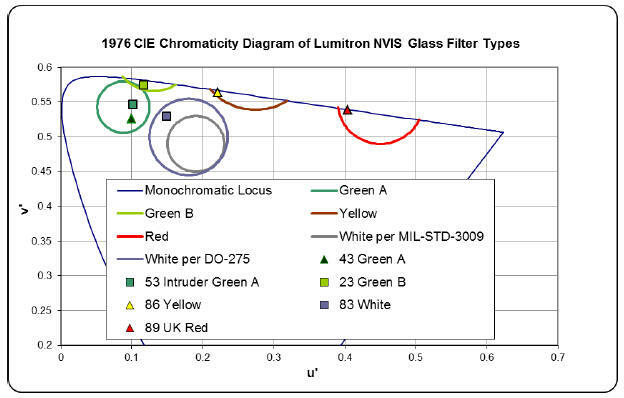 Lumitron NVIS glass filter material is designed specifically for incandescent lamps. Our standard and monolithic glass construction NVIS ring filters and NVIS flexible lead ring filter lamps (lamp/filter assemblies) offer reliable, rugged, and temperature resistant NVIS compliance in lighting applications where low wattage subminiature incandescent lamps are the preferred source of illumination. Our NVIS flexible lead ring filter lamps are constructed with aerospace-grade materials and best-in-class MIL-DTL-6363 military specification subminiature lamps. NVIS compatibility is typically achieved when the glass is machined with a wall thickness of 0.040 (1.0 mm). Lumitron NVIS glass filters and flexible lead ring filter lamps are supplied by default with polished surfaces inside and out for maximum light transmission. Matte finish surfaces are also available. Lumitron PolyVision (PV) is an NVIS compliant, high temperature polymeric (HTP) optical filter material designed specifically for incandescent light sources. PolyVision allows for greater design flexibility and shorter lead times while meeting fully compliant NVIS lighting requirements. Precision machining of optical filters eliminates many of the constraints of glass fabrication or injection molding for virtually infinite dimensional configurations with no significant tooling cost. Precision machining of optical filters is a Lumitron specialty.